Is Crowd Sourced Funding Equity Raising a Unique Opportunity for Accountants? create a variety of interesting work for your team, thus contributing to improved team morale, team retention and improving your team hiring. There is no longer any requirement for private companies to convert to an unlisted public company to be able to raise capital – but you will have to market your willingness for your accountancy firm to be involved in this market activity, which will commence from around mid-October. In the first instance, company directors/managers will need an understanding of how Crowd Sourced Funding Equity Raising for private companies works. There is a need for clients to understand the role of Crowd Sourced Funding Intermediaries and the process through to the preparation of the Crowd Sourced Funding Offer Document. Some clients may also be interested in engaging your accountancy firm to supply a virtual Chief Financial Officer Service. This potential work represents a significant a significant amount of professional fee income. Why not prepare a client matrix identifying clients that? have group annual turnover under $25 million. have group gross assets valued at under $25 million. doing something audacious that makes business sense! have the energy and ambition to operate a larger business and will respond to the extra discipline required to operate a “de facto public company”. These are the prime clients or prospects (and yes you should be looking for prospects, because unfortunately many accountants will not grasp this opportunity and will perhaps think about it when “star clients” have moved on) that I recommend that you start talking to now and invite them to a seminar in a couple weeks’ time (and yes, if you subscribe to ESS BIZTOOLS we will supply you with a complete package to present a seminar to your clients/prospects on Crowd Sourced Funding and everything else to give your accountancy firm resources to utilise with your client/prospects). Interested? Why not register for a FREE webinar for accountants/business advisors on Thursday 27th September at 12.30pm AEST titled “Crowd Sourced Funding New Legislation”. Peter will go through the Crowd Sourced Funding raising story for accountants. (Click here) to register for this FREE webinar. You will also be sent a recording of this webinar. We are also presenting a special webinar for SMEs on Wednesday 26th September 2018 at 12.30pm (AEST), covering the opportunities from utilising Crowd Source Funding Equity Raising. If you wish to alert some of your clients to this webinar please do so. If you wish to attend this webinar with your clients, please do so. If you wish to register for the SME webinar, please (click here). The ESS BIZTOOLS’ packages include our new Crowd Source Funding Equity Raising Private Company Product Package, which commences with giving you resources to brief your client on Crowd Sourced Funding and continues right through the Crowd Sourced Funding equity raising journey. Our 25% discount offer to celebrate the start of the new financial year for our Silver Package, which includes the Crowd Sourced Funding Equity Raising for private companies’ package, is available for $1,493 (plus GST) and has been extended until 2nd October 2018. I invite you to visit our new website www.essbiztools.com.au so that you can gain a first-hand understanding of the wide range of product packages that we have to assist accountants/business advisors on this journey to supply SME clients with a wider range of business advisory/commercial services. 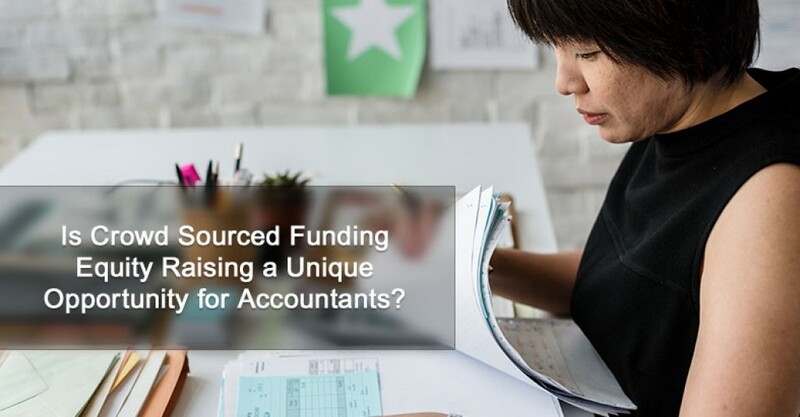 At the beginning of this article I asked, “Is Crowd Sourced Funding Equity Raising a unique opportunity for accountants?” I hope you agree with me that it definitely is. If you have any questions on any aspect of the Crowd Sourced Funding Product Package or the ESS BIZTOOLS’ Gold or Silver Packages, please do not hesitate to contact us – peter@essbiztools.com.au or telephone 1800 232 088. Episode 171 - Is Crowd Sourced Funding Equity Raising a Unique Opportunity for Accountants?